Even if you don't like cheese, this Thanksgiving appetizer idea is so cute you might convince yourself to serve these cheese pumpkins anyways! And if you aren't one for serving appetizers before the biggest meal of the year, they would make a cute edible garnish too! They are a lot easier to make then they look! 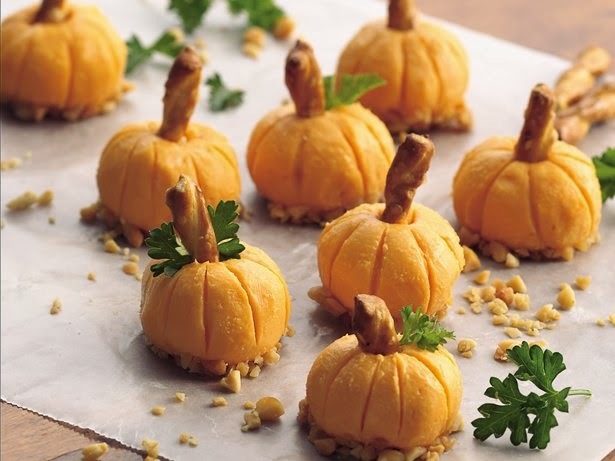 You use a tablespoon of store bought cold packed cheese spread, roll it in a ball, then after letting them chill in the fridge, you make the ridges with a toothpick and add a pretzel and some parsley to finish off the pumpkin look. If you have an aspiring young chef in the house, this might be the perfect Thanksgiving day activity to keep them busy in the kitchen. These are so cute! Just had to pin them. Thanks for sharing.